Read this article in the New York Times: The Denials That Trapped Greece. Let’s get this straight: Greece’s European partners should not hold the Greek nation responsible for the PM’s miscalculated or ill-advised political maneuver. The misstep can be handled internally. Let’s stop overreacting and humiliating an entire nation. History taught us that this never led anywhere. The Europeans, of all people, should know this very well. The international media seems to be missing the point. Yes the referendum adds uncertainty and possibly infuriates Greece’s euro partners by seemingly undermining their decisions, however, it should calm down the Greek public uproar and provide an outlet to vent. It also sends a clear signal to the IIF for all banks to voluntarily accept the debt deal, and to Greece’s euro partners that Greek sovereignty cannot be compromised and no more austerity measures will be implemented or the people will not vote for the deal. 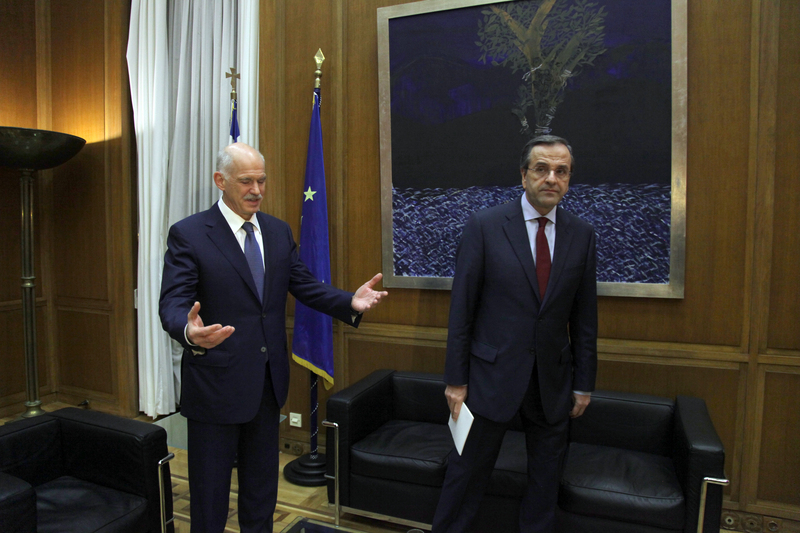 In the mean time, Papandreou’s government has plenty of time until January to stir public opinion, provided the government survives. The bigger current issue is the vote of confidence on Friday. Given today’s parliamentary defects, whether Papandreou’s government survives or not is highly questionable at this point. 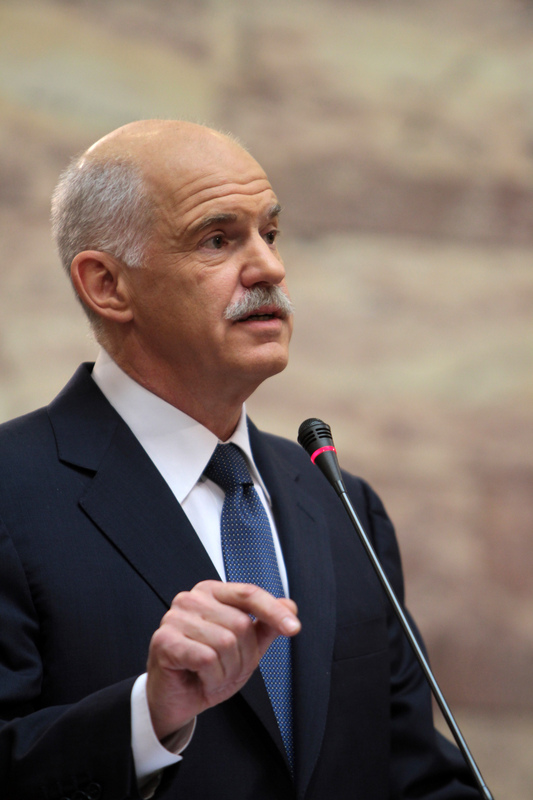 I gnomi mou gia tis stratigikes Papandreou einai. Genikos hiristike tis katastaseis oso kalitera mporouse dedomenon ton sinthikon kai dedomenou tou anthropinou dinamikou pou ehei sti diathesi tou. Ta lathi pou tou katalogizo, katanoontas oti einai kato apo antixoes sinthikes vevaios, einai ta exis. Efoson eide to provlima me to dimosio hreos noris kai apofasise na to dimosiopoioisei amesos, eprepe na kanei anadiapragmatefsi amesos prin paei sto IMF kai stin Evropi. Oi oikonomologoi tou to eipame. Ena kourema 20-30% sto sinoliko hreos tote tha eihe perasei shetika anodina kai tha eihe katorthosei poli perissotera apo oti ena kourema tou 60% mporei na katorthosei simera sto meros tou hreous pou morei na anadiapragmatefthei tora. To allo lathos itan epikoinoniako. Tin tehniki voithia kai tin epivlepsi eprepe na min tin zitaei anoihta opos tin zitouse. Oi Ellines eimaste iperifanoi anthropoi. Eprepe na pei ehoume eghorio anthropino dinamiko na kataferoume oti hreiazetai. I kaki epikoinoniaki politiki odigise ston na min vlepei o kosmos ta ofeli tis simfonias pou sinapse tin proigoumeni evdomada, kai to mono pou eide itan mia ipotithemeni apoleia ethinikis kiriarhias. Apo tin alli, den ton voithisan kai oi sinthikes. O Germanos ipourgos oikonomikon stin prospatheia tou na apotharinei alles hores na zitisoun kai aftes kourema, ekane mia akompsi kai akairi dilosi pou htipise ton Elliniko lao se simeio pou ponaei.